This week, a team from the Vancouver Aquarium Marine Mammal Rescue Centre rescued an emaciated and weak California sea lion from a Campbell River beach. “We received several calls from concerned members of the public about a sea lion at Willow Point,” said Lindsaye Akhurst, manager of the Rescue Centre, in a statement Friday. Working with personnel from Fisheries and Oceans Canada, the team assessed the animal and determined it needed to be admitted to the Rescue Centre for treatment. On Tuesday, the team travelled to Vancouver Island and was able to secure and transport the young male back to the Rescue Centre in Vancouver. The animal is estimated at three to four years old based on the smaller size of his sagittal crest, the bony protrusion on his head. A thorough exam by the veterinary team on Thursday determined the animal is dehydrated and emaciated; and weighs only about 100 kilograms, or 220 lbs. Bloodwork, urinalysis, x-rays and ultrasounds showed some abnormalities in his blood consistent with renal changes, as well as some degree of pneumonia in his lungs and an old fracture to his left hind flipper. Vancouver Aquarium head veterinarian Dr. Martin Haulena said many of the symptoms are consistent with prolonged malnutrition and dehydration. Since being admitted, he’s been treated with supportive therapy, fluids and medication. Akhurst said members of the public who called in to report the animal did the right thing. “Sea lions are large, wild animals and can be unpredictable,”Akhurst said. California sea lions – or Zalophus californianus – breed off the coast of Southern California and the Baja peninsula. During the non-breeding season, large numbers of animals, mostly male, migrate north to B.C. Despite being hunted for thousands of years until they were protected in the 1970s, the current population of California sea lions is considered healthy. If you see a marine mammal that you believe is in distress: stay back, keep people and pets away, call the Marine Mammal Rescue Centre at 604-258-SEAL (7325). 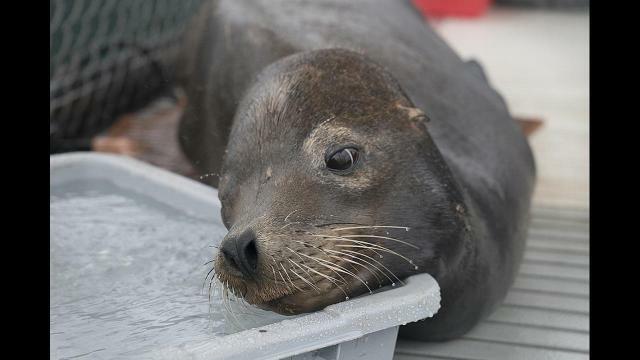 A team from the Vancouver Aquarium Marine Mammal Rescue Centre rescued an emaciated and weak California sea lion from a Campbell River beach this week.